This is also sometimes referred to as single ended power amplifier. The term “single ended” (denoting only one transistor) is used to distinguish it from the push-pull amplifier using two transistors. In case of a direct-coupled class A power amplifier shown, the quiescent current flows through the collector resistive load and causes large wastage of dc power in it. This dc power dissipated in the load resistor does not contribute to the useful ac output power. Furthermore, it is generally inadvisable to pass the dc through the output device such as in a voice coil of a loudspeaker. 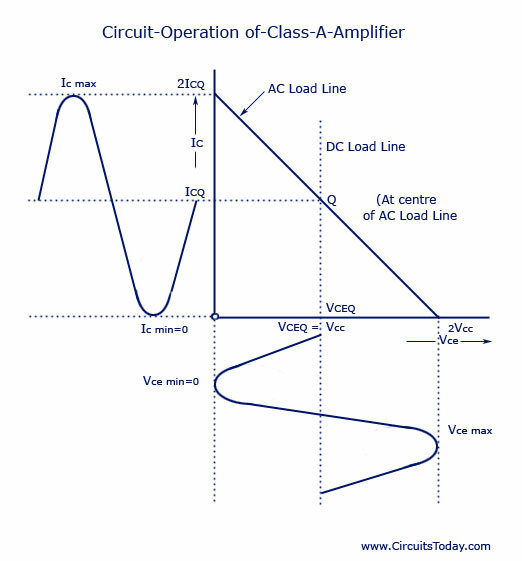 For these reasons an arrangement using a suitable transformer for coupling the load to the amplifier is usually employed, as shown. 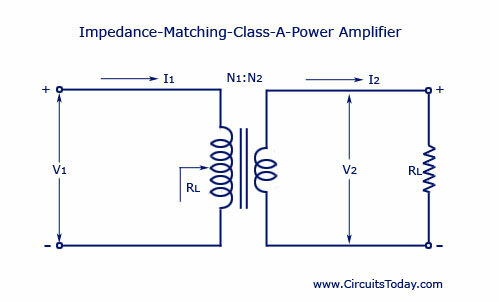 This arrangement also permits impedance matching.In a power amplifier circuit shown RtÂ and R2 provide potential divider bias ing and emitter resistor RE is meant for bias stabilization. The emitter bypass capacitor CE is meant for RE to prevent ac voltage. The input capacitor Cin couples ac signal voltage to the base of the transistor but blocks any dc from the previous stage. A step-down transformer of suitable turn ratio is provided to couple the high impedanceÂ collector circuit to low impedance load. where a is ratio of primary to secÂ­ondary turns of step-down transÂ­former, RL is the resistance of load connected across the transformer secondary and R’L is effective resistÂ­ance looking into the transformer primary. Circuit Operation. In this circuit dc (winding) resistance deterÂ­mines the dc load line. Typically, this resistance is quite small (assumed to be zero) providing dc load to be a vertical line rising from Vcc, as shown. When an ac signal is applied to the base of the transistor the collector current will vary around the operating point Q. In order to have maximum ac power output, the peak value of collector current due to input ac signal alone should be equal to the zero-signal collector current. To achieve this, the operating point Q is located at the centre of the ac load line. This is achieved by adjusting the biasing circuit (R1, R2 and RE).Â When ac signal is applied, collector current fluctuates from maximum to minimum (zero), and operating point Q moves up and down the load line. At the peak of the positiveÂ half cycle of the input signal, the total collector current Ic max = 2 Ic and collector-emitter – voltage Vcg min = 0 while at the peak of the negative half cycle of the input signal, the collector current Ic min = 0 and collector-emitter voltage Vce max = 2 Vcc. Thus collector-emitter voltage varies in opposite phase to the collector current. The variation of collecÂ­tor voltage appears across primary of the transformer. Now ac voltage is induced in the transformer secondary which in turn develops ac power and supplies to the load. Collector efficiency = Pout (ac)/ (VCC ICQ)/2 Ã· VCC ICQ = 0.5 or 50%. 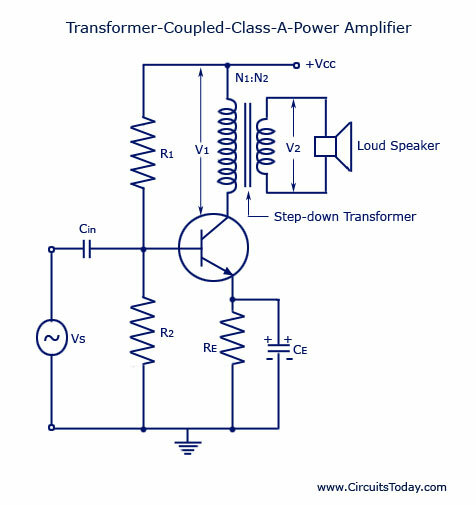 Thus for a transformer-coupled class A power amplifier the maximum theoretical efficiency is 50%. In practice, the efficiency of such an amplifier is somewhat less than 50%. It is about 30%. The larger the value of Vce max and smaller the value of Vce min the closer the efficiency approaches the theoretical limit of 50%. Well-designed circuits can approach the limit of 50%. The larger the amount of power handled by the amplifier, the more critical the efficiency becomes!